A monster quilt, that is! If you want to find out more pop over to visit Liz to read my contribution to her series on monster (big) quilts - I hope you enjoy it!! Honestly, you'd think I never feed him!! 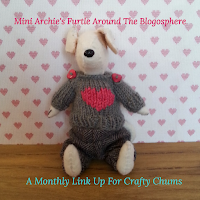 I'm just popping in to quickly post about the Fugly Fabric Party that's going on over at Lucy's blog Charm About You. This time I've had quite a time coaxing my remaining fuglies out of the drawer (I thought I'd got rid of them all last time passed them onto a new home after the last fugly party but these two were cowering at the back of the drawer, half hidden in the shadows...not surprising, really!) and they've only agreed to come out and show themselves on the condition that they can hold hands and that nobody laughs. So, if you laugh can you do it silently or into your hankie? Thank you! Yup, they sure are fugly!! Now, in my defence the orange one (which is a FQ) was a bran tub 'prize' and the floral (which is a half metre of fugliness) was bought on-line and looked much better in the thumbnail! 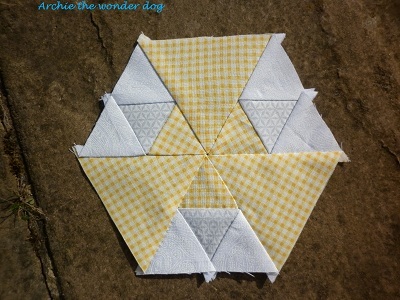 I bought it when I was collecting fabrics for my hexies and I'd hoped it would be suitable for fussy cutting, either for whole hexies or for the centres of pieced hexies. 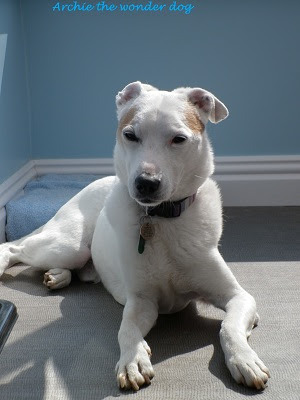 And it was ridiculously cheap - £3 a metre...and now I know why!! 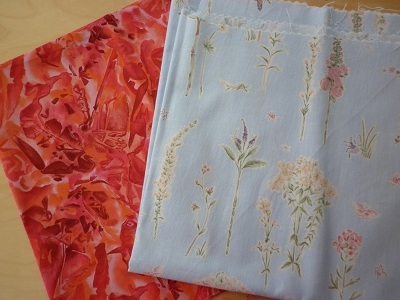 Both fabrics would be great on the inside of cushions and I think the orange in particular would benefit from some cutting - I think small pieces of it would be great in a scrap quilt. 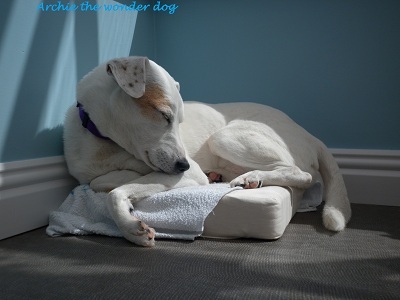 Just not my scrap quilt! Now, although they're shy, I'm confident that if they know they're going to a good home and are guaranteed a nice welcome they can be persuaded into separate envelopes but they will also be happy to be placed together. If you're interested please leave me a comment - I'll post anywhere in the world (oh, 'Fuglies Take Flight', what a great idea for a cartoon strip! No? Just me then!) so no need to be worried that you live outside of the UK and are going to miss out, these fuglies can (and will!) travel. Edited to add: The orange fugly has been lovingly claimed by Liz! And the floral fugly has been adopted by Joyce! The ATWD Fugly Fabric Party has ended - short but sweet!! I'm still busy with my Stained quilt and cleaning. Actually, that's a lie. I've almost finished the cleaning and just have to spend about another half hour on it and it will be done. (Until the next time!) 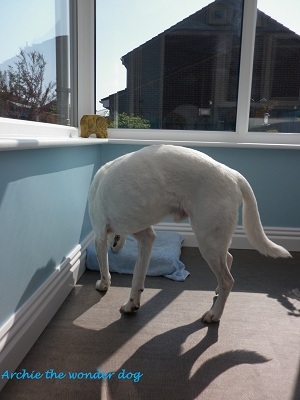 In fact, I'm sitting in my wonderfully clean conservatory at the moment, enjoying the peace and quiet (but not enjoying the way I can see my own reflection in the laptop screen - most off-putting!) 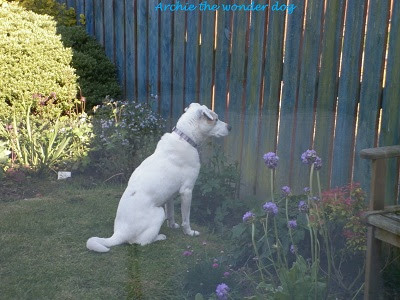 and admiring my garden (and the goldfinches) through my newly polished windows. Pleased with myself? Well, maybe a tiny bit but I think it's deserved! It's also a lie that I'm busy with the Stained quilt. 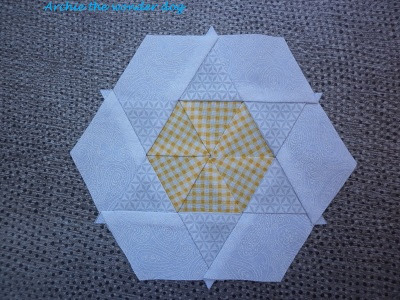 I had a really good run and pieced all the blocks but now I've run out of steam (I blame the cleaning) - I'm flogged at the moment so I'm at a little bit of a standstill. I'm hoping to get the sashing strips cut this evening and attached tomorrow. 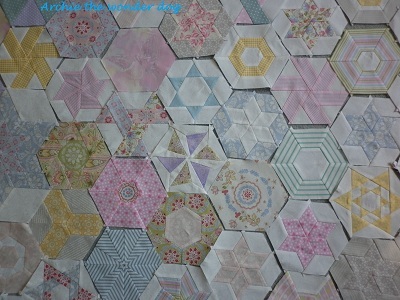 I've already sorted the block arrangement so once the sashing is on I should could may have a complete top in no time! And when I do I'll be back for a ta-da post! 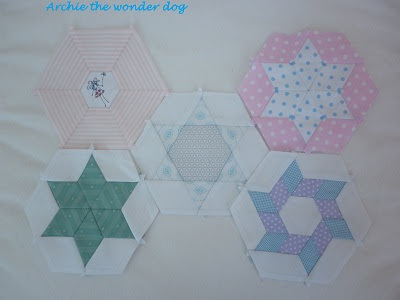 In the meantime you'll have to make do with a photo of four blocks that I uploaded to Flickr to prove I was actually joining in the Stained QAL and not just looking at my fabric!! 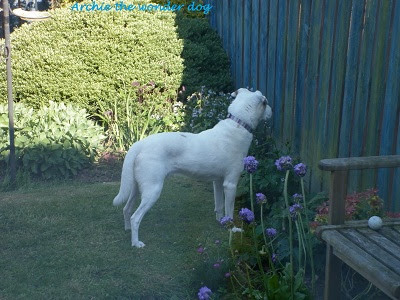 Should I go to the bother asking for a biscuit or stay here and enjoy the sun? 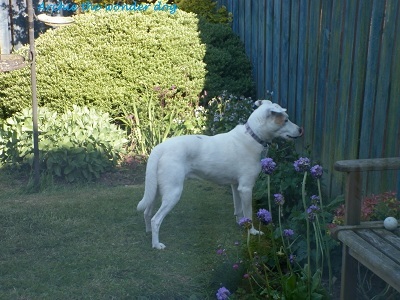 Don't forget to consider giving the fuglies a lovely new home (please, someone, anyone, take them!!) and once you've left me a comment telling me how much you'd love one (or both) of the fuglies why don't you pop over to the party and see who else you can take home with you? P.S. 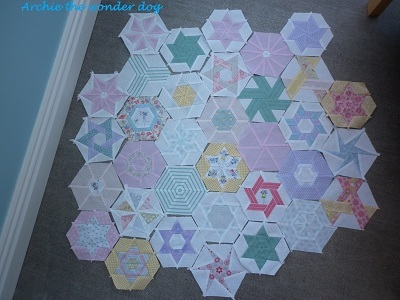 Thanks for all the lovely comments about the 101 hexies - you're all so nice! I think it's about time I shared photos of my one hundred and one hexies - here they are in a pretty stack, no reason for it I just fancied seeing how high it would be! 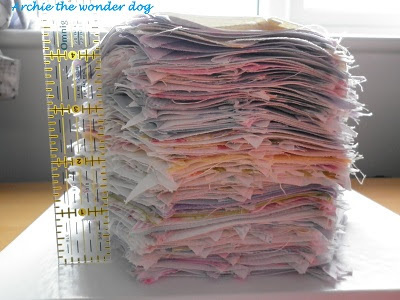 101 hexies make a stack about 4.5" high - not a lot to show for eight months of sewing! 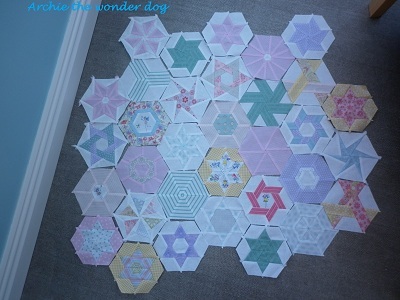 They took quite a while to arrange on the floor as I was trying not to get the same fabric or the same type of hexagon next to each other. 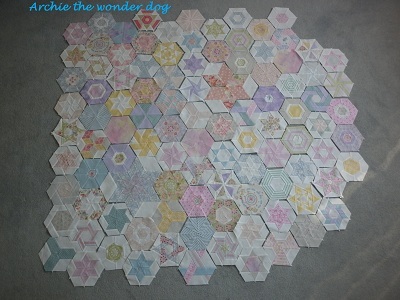 I'm not sure I managed it and I'm not sure it was worth the effort but this is what 101 hexies look like when they're all in the same room and playing nicely together. 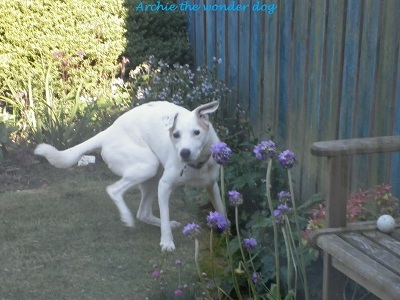 Sorry for the awful photo - the weather was awful the day I did this (although not as awful as the days preceding it!) 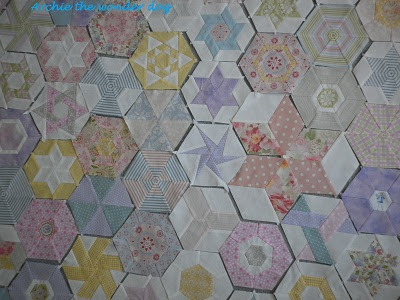 and the only way I can get a photo of all the hexies is to put them on the front room floor, stand on the fourth stair and lean over the bannister!! Oh for a big design wall! I only took two close-up photos (I wish I'd taken more! 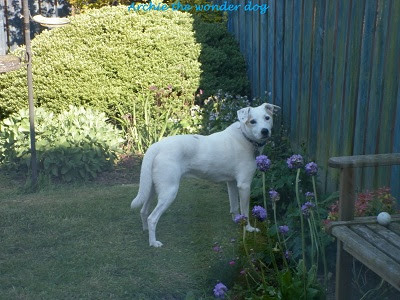 ), the other one is in my last post! They're hard to spot so here's a photo with a bit of a clue! I'm really pleased with it so far and think that so far I've managed to get a good variety of types and a good balance of colour - what do you think? Any colours I need to use less or more of? 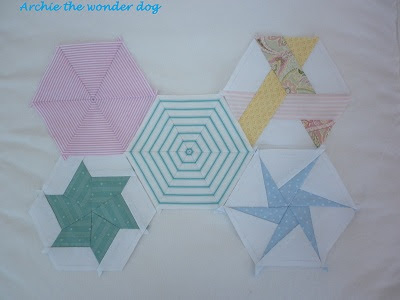 I've got many more of the 'star in a hexagon' hexies than any other type but that's deliberate - I decided that I needed plenty of simple hexies to off-set the more complex hexies. 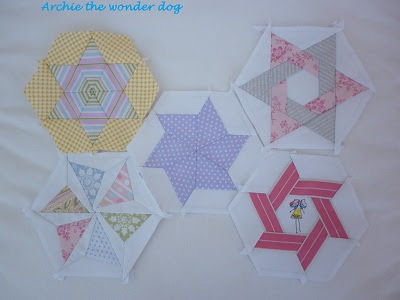 If they were all smarty pants hexies they might end up fighting! 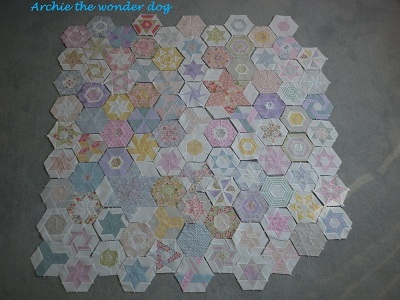 I'm also wondering how many whole hexies to include - any thoughts? I'm still not sure if I'm going to be adding sashing - my plan is to make hexies until I either run out of the white-on-white background fabric or hit my 202 mark (whichever happens first!) and then I'll have a good think about it. 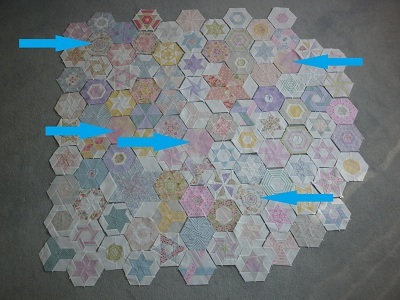 The sashing would make it a lot easier to join the hexies together (many of the seams won't nest together due to the seam allowances sometimes swirling clockwise and sometimes swirling anti-clockwise) but one solution would be to add more whole hexies and to ensure that they're between any awkward hexies that happen to end up next to each other. 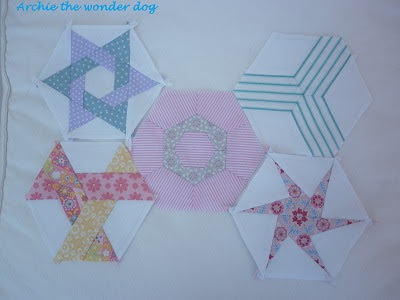 I honestly can't see me taking the direction of seams into account as I arrange all the hexies but I think I could arrange them and then sort out the troublesome ones. 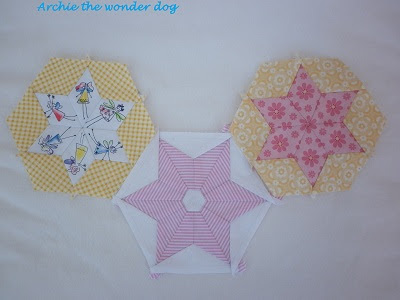 Or I could (as Elly suggested) add triangles between the hexies but, although I love the way it looks, (Cathi has added setting triangles to her hexagons) I'm not sure if that would help with some of the seam allowances. If anyone has any other ideas please shout! 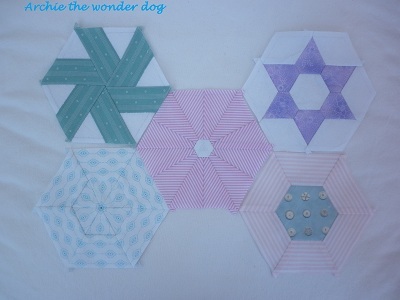 I've been busy making some Stained blocks from Sarah's QAL. 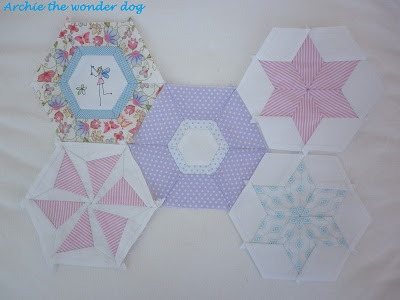 I think I've made about twelve at the moment but although I've taken some photos I'm not sharing them yet, I wanted this post to be about the hexies! 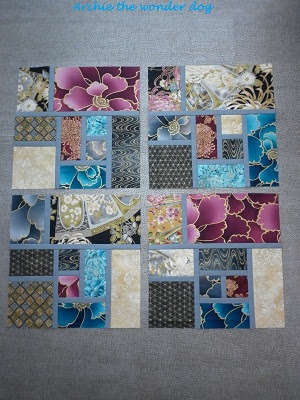 I'm really pleased with how the Stained blocks are looking and I'm already thinking about how to quilt it. This quilt will be for my mam and she likes a heavy quilt so I'm thinking of using a double layer of wadding (probably Warm and Natural) - does anyone have any experience of (machine) quilting through two layers of wadding? 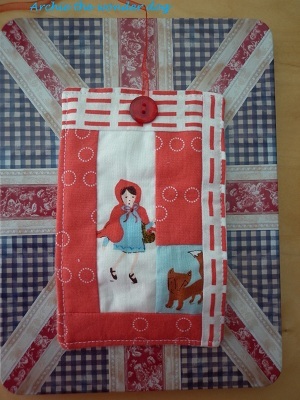 I'm going to be doing straight/wonky lines (no FMQ here!) but any tips or thoughts on needle choice (unless someone tells me otherwise I'm either going to use a topstitch or a quilting needle) will be gratefully received! 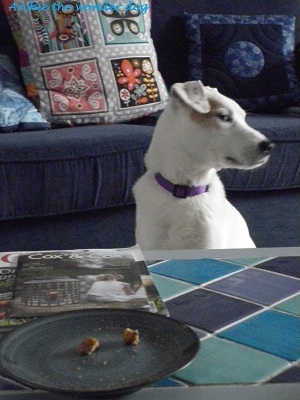 I'll leave you with a few photos of Archie coveting the remains of my breakfast. 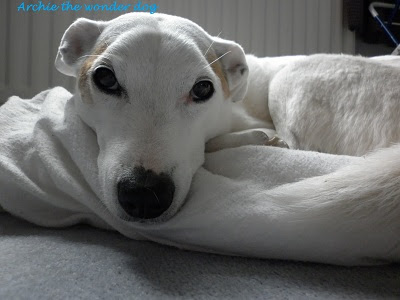 His (big blue) liver tablets have to be taken on an empty stomach (preferably after an overnight fast) and at least an hour before food so I give him it as soon as I wake up (such a rude awakening for him!) 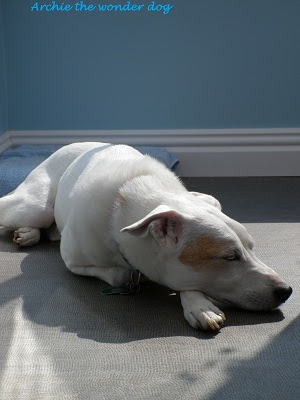 and then he goes back to sleep until he hears the magic sound of my breakfast being prepared. (But only if it's toast - if I'm having cereal he waits until he hears me put my spoon back in the bowl after eating as he occasionally gets the teaspoon of milk that's left!) 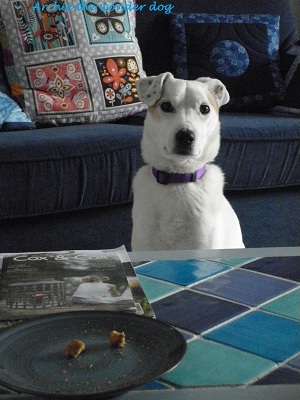 If I have toast for breakfast he usually gets the last little bit of each slice and he's just not used to having to wait! What do you mean 'Not now?' I don't understand! 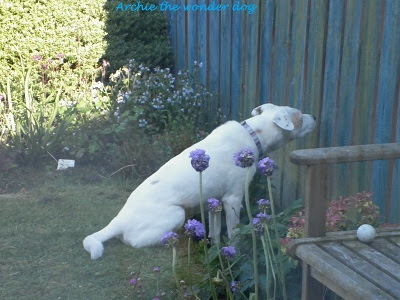 Well that didn't work - I'll go back to staring! 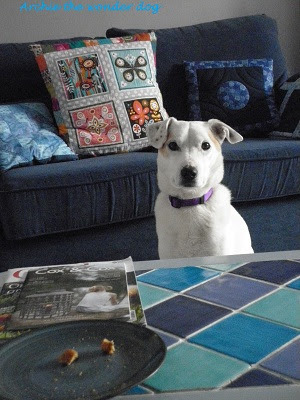 He kept that up for ten minutes before I moved the plate into the kitchen - he followed and settled himself on the floor for a long wait...no wait is too long if food is involved! Wish me luck, I'll be back when all the Stained blocks are together and my conservatory is sparkling. Well, definitely the former, possibly not the latter! Edited to add (I'm having a forgetful day! 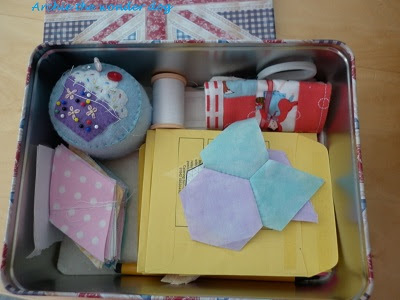 ): I'm linking up with Lee@Freshly Pieced for her WIP Wednesday - so please hop over and see what other people are working on!